One of the first things that seem to confirm the diffusionists view are pyramids. They are found at both sides of the Atlantic Ocean and although mostly they're quite different in design, there's one in present Mexico, reminding me of the pyramids at Gizeh in Egypt: the "Pyramid Of The Sun" in Teotihuacan. This is in the first place because of the straight forward design, lacking any ornaments. And even more: there's a tunnel underneath the structure. Not a nicely build one, like in Egypt, but more like a rough, hewn (maybe even natural) cave. It is possible, that the pyramid had been build over an much earlier sacred site. When we talk pyramids, we usually associate this with the stunning marvels of plain beauty at Gizeh in Egypt, and in America we think of the richly decorated step-pyramids of the Aztecs, Maya and Toltecs. But in Egypt, pyramidbuilding included step-pyramids and continued up to the 17th dynasty and stopped around 1550 BC, and pyramidbuilding in Mesoamerica began much earlier, with the Olmecs. Thanks to the oil industry, nothing of that survived. 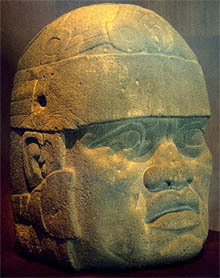 The Olmec civilization started around 1500 BC, as far as we know now! Additionally, even older pyramids were found in Southamerica, build from adobe bricks by people like the Tucume and the Huaca. Nonetheless, pyramids may not be a very good example of diffusionism. No real link can be made. The pyramid is a basic geometric shape and the differences in design might be considered too great. 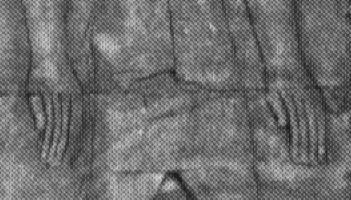 A bit harder to explain is the appearance of traces of cocain and nicotine in Egyptian mummies. Since both substances are found in native plants in America but not in Africa (in that time), some researchers think of a possible trade link. If you want the hole story, you can read a transcript of the TV-programme about the Mystery of the Cocaine Mummies (new window). West explains it as a sign whether the person in question is in a purely receiving or purely giving position. 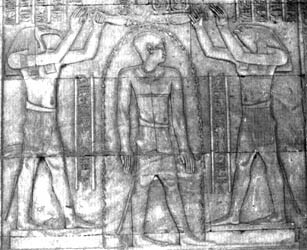 This pharaoh receives life and power from the two gods beside him, so he is purely receiving and shown with only left hands. ...and then in America. In South America, to be specific. (This stone is the only one with that specific feature that I know of, the others seem to have all "regular" hands.) 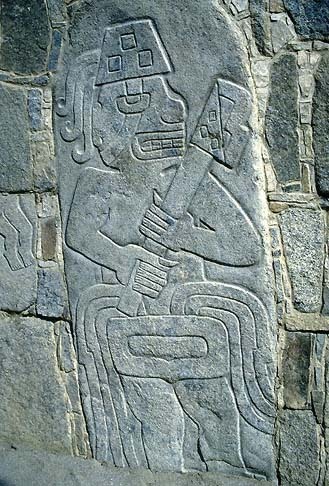 ..and the next in Tiahuanaco, inside the walled complex known as "Calasasaya". As in the previous picture, the (normally) right hand had to be shown from the inside, in order to turn it into a left hand. 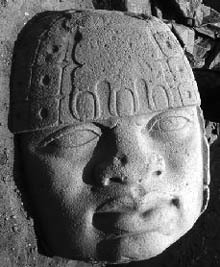 But similarities between these ancient cultures don't stop here. 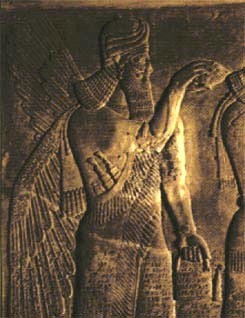 An often seen feature of Assyrian and Babylonian gods are small "buckets", holding sacred salve, according to the archaeologists explanation. 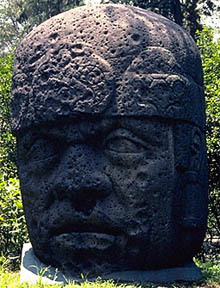 Then follows the big step over the ocean, this time to the Olmec site of La Venta (Mexico). 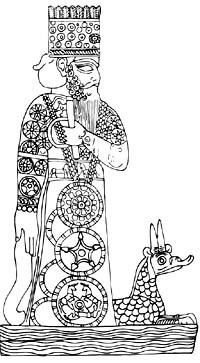 The figure is thought to depict a priest on a serpent. And wat does he carry there? 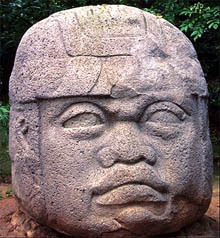 Many theories exist about the possible African origin of the Olmecs. 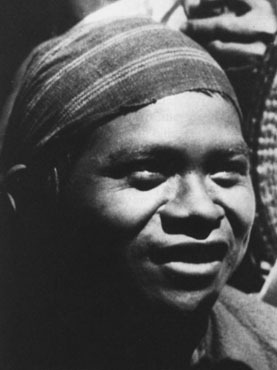 One of these theories states, these people were actually from Nubia, which was south of Egypt (now Sudan). 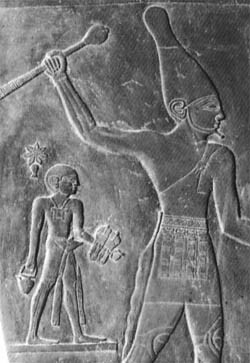 This theory looked to me not more interesting than others, until I found a particular picture in a book about Ancient Egypt. I'm very sorry, that I can't place this picture here, because I don't have this book myself. It showed a small object (the size of a ring), made in Nubia, depicting a human face looking out of a lions mouth. Now, this is something! 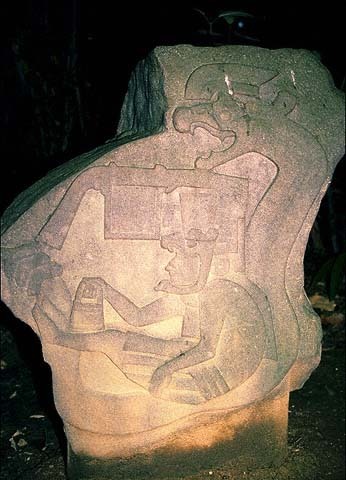 I have never before seen something like this made in the Old World, but it is a common theme in Mesoamerican cultures, especially the Aztec. 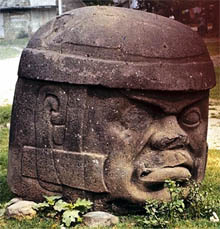 In these cultures, the animal typically would be an eagle, a coyote or a snake. 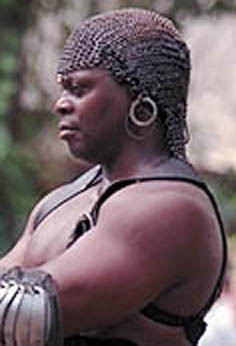 But serious: the african physiology is evident. I found this picture here somewhere on the net. 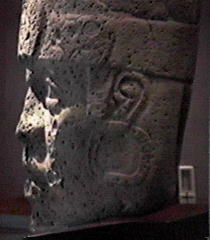 A professor tried to use it as proof, that the heads don't show Africans, but native Americans. 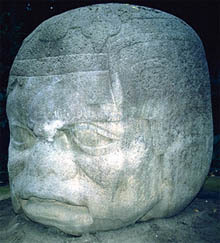 It is a Tzotzil from the state of Chiapas in Mexico. 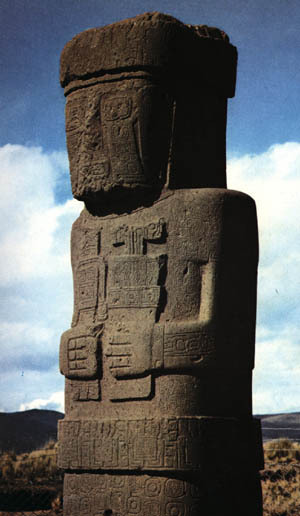 I don't argue that he is a Tzotzil. But does it do anything to the fact that this man also has some of the negroid facial characteristics? Questions, answers, corrections? Please email me: konstantin_artz@hotmail. No navigation bar at the top? Please click here.